Easter came way to fast for me this year, probably because of the two weeks before - going to the beach and all the family sickness - but it all turned out really nice. 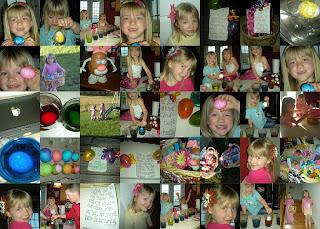 The girls really enjoyed coloring the eggs, and yes we had a lot of color for our 12 little eggs. They also loved the little scavenger hunt that the Easter Bunny left for them, they found their baskets with goodies and lots of cute little flowers. (thanks to Aunt Heather) If you want some of your own cute flowers check out her blog here. So as many of you know Gregs Parents have a beach house about 3 hrs from our house. So if we ever need to get away it is a place that we go and enjoy quality family time! This year Kaitlyns Spring Break was 13 days long and so I thought that it may be a perfect oppurtunity to go to the Beach. For some reason good ideas always come with a price....The week before we were supposed to leave Haylee had a bad cough 104 temp , Greg took her to the Dr. were they said it was bad croup and sent him home..2 days later she was just as bad so I took her back to the Dr. then they decided she had bronchitus, the start of pnemonia, and most likely strep...this was the day before the Trip...! We decided to still go cause she now had medicine. We get to the Beach and the next day Kaitlyn starts with a fever... thankfully hers broke and never much else..weather wasnt great and a day or so into the trip ...I started to feel sick ! But after all is said and done we enjoyed some much needed relaxing and just Spending Time with the Family!!! What do you think of the new look? Happy Spring!!! !